Many employees suffer though poorly given feedback by their manager. But sometimes it is hard to figure out exactly why it is poor feedback. One reason that feedback given by a manager is often poor – even if it is specific, immediate and behavior-based (markers of good feedback) — is that it is not entirely relevant to the employee’s job. Oh, the feedback from your may seem relevant, because it is job-related. But it isn’t really job related. To help explain, I created this model of the areas managers have been known to give feedback on. You’ll see in the model that there are a lot of areas that managers can give feedback on. So one would hope that a manager would be judicious and be focused on the areas most relevant to the employee’s work and the impact of that work. However, as the circles show, managers often default to more extraneous areas of job performance, such as perceptions of others and behaviors in meetings that are indirect (at best) to job outcomes. 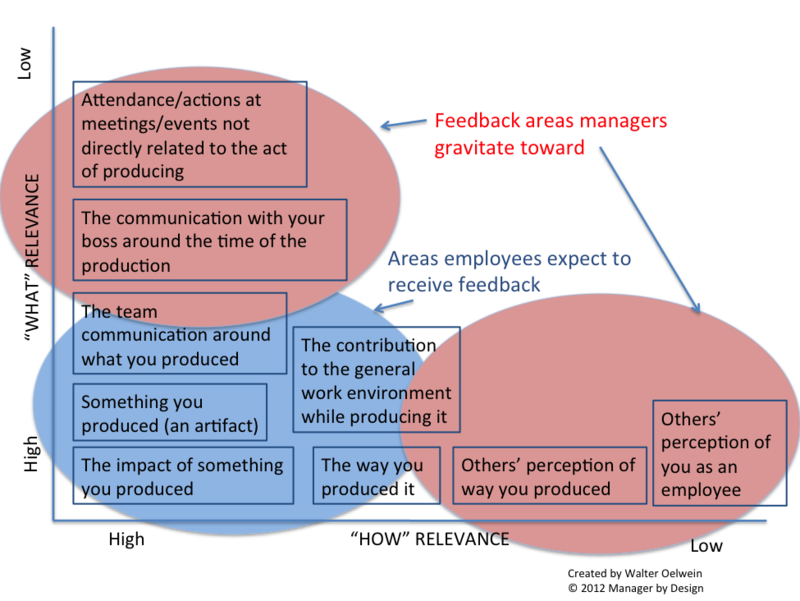 At the same time, employees anticipate and expect feedback in areas contained the blue circle. They expect to hear from their boss what the boss thinks of the impact, the artifacts, and method/technique/communications used to produce, and how it contributed to the results. Instead, employees often hear about what the interactions with the manager and status reports delivered to the manager are like, and what others are saying. It seems job related, and because it comes from the manager, it must be job-related, because the manager cares about it. But, alas, the feedback in the red circles is less-job related; it is less relevant. Is the feedback discussing the positive or negative impact of that artifact that was produced? Is the feedback discussing the process/method that you used to produce the artifact? Is the feedback discussing the communications you engaged in while producing the artifact? Is the feedback discussing the manner you interact/communicate with your boss? Is the feedback discussing others perceptions of the way you produced the artifact? Is the feedback discussing your actions in areas not related to producing an artifact? Is the feedback on others’ perceptions of you as an employee? Why do the ones related to others’ perceptions get 0 points? Because the only way you can systemically change others perceptions is through producing better work (items with 5 points). There are ways to non-systemically change others’ perceptions (taking people out for drinks, enlisting the help of a mole, starting rumors, creating distractions, writing passionate emails explaining yourself, etc. ), but this involves not doing better work, and doing actions that take away from actual job performance. These are actions that, at the core, are not relevant to doing your job. So if you are in a feedback session with your boss, you can keep this scorecard in mind. After listening to and acknowledging the feedback on areas that are less relevant, you can determine if you’d like to steer the conversation to the areas of your job that are more directly related to your job. If you can train your manager to give feedback on the non-phantom part of your work (and this will take work), then you will likely do better at the two “phantom” parts of your job (managing perceptions and performing in front of your boss/boss’s boss), since your actual job performance and actions will contribute more to the “performance in front of your manager” job and the “what others’ perceptions” are job. You may want to start the project of giving this feedback to your manager, so your manager can improve at managing. Oh – and to managers – try to focus feedback to your employees on the actual job. Once the actual job has been mastered and the employee is performing at an extremely high level, then you can start giving feedback on these phantom jobs. But it probably won’t be needed, if the employee is performing the actual job at a high level.